I Found A Shed, Now What? Finally you’ve found the needle in the haystack! For some this is a common success, but for others, not so much. Shed hunting in crop country is different than mountainous timber country. Simply navigating the uneven terrain can be tough. This added level of difficultly makes each find a true trophy. But does the game end there? No, the hunt has just begun! Finding a shed is just one piece to the entire puzzle. New smartphone technology allows us to document the routes we take, distances we cover, and save specific locations. Once the shed is found we mark and save the location on an aerial map. This provides us with the exact location of the find. Once marked, we continue to search hard for the other side. After returning to the office, we transfer the location onto a topographical map. This determines the most likely travel routes. We typically prefer to hunt deer in transition. This means not hunting directly over food plots or bedding cover. Here in the northern Ozarks, the terrain plays an enormous part in this tactic. Terrain determines where deer travel while limiting where we can hunt. Quick changes in elevations means thermals determine where our stands are located. The area where the shed was found is a great indicator that Swoops may commonly travel there. But can we hunt there? Once the location is analyzed on a map we return to get boots on the ground. Immediately we start looking for specific trails deer may be using. After this, we determine if we can approach, hunt and exit the area undetected. If not, then we continue on the trail to find an area where we can. Once a huntable location is found we check the wind! During scouting trips we carry Dead Down Wind Wind Checker. Using this allows us to visualize how the wind moves through the timber and hills. If we see swirly movements in the wind, we move on. Hunting areas like this almost always results in a bust. The search continues until the perfect ambush location is found. All this work comes from a nice shed found lying on the ground. This work may now result in success during the upcoming hunting season. 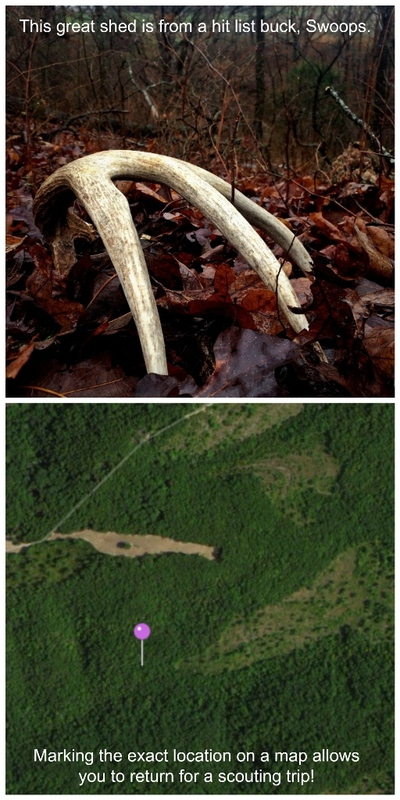 If you are out shed hunting, take the time to focus on each find. Use this information to assist you in closing the distance on a mature buck!